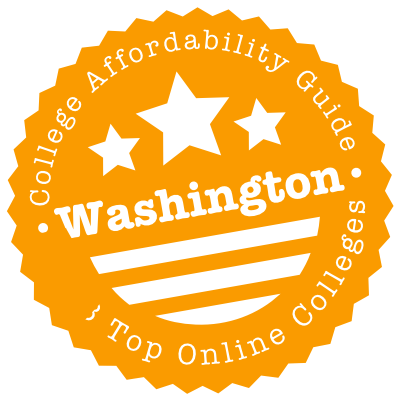 Scroll down to see the top not-for-profit colleges and universities in Washington offering online degree programs. Washington State University offers nine bachelor's degrees and eleven Master's degrees entirely online. The bachelor's degrees are in accounting, hospitality business management, management, management information systems, criminal justice, human development, humanities, social sciences, and psychology. The Master's degrees are in criminal justice, special education, strategic communication, executive M.B.A., M.B.A., engineering & technology management, agriculture, agriculture - food and science management, agriculture - plant health management, electric power engineering, and molecular biosciences. A variety of financial aid is available for online students as well as on-campus students. Online courses are ideal for students who have busy schedules as the coursework can be completed whenever it is convenient, but some courses may require proctored exams. Online students can take classes in full-length semesters that begin in January and August as well as summer sessions beginning May or June. Online students can take advantage of many of the resources that on-campus students also enjoy. Central Washington University offers ten undergraduate degrees and seven graduate degrees: a Bachelor of Science in Aviation Management, a Bachelor of Arts in English - Professional and Creative Writing, a Bachelor of Science in Information Technology and Administrative Management, a Bachelor of Applied Science in Information Technology and Administrative Management, a Bachelor of Science in Interdisciplinary Studies - Social Sciences, a Bachelor of Arts in Law and Justice, a Bachelor of Science in Paramedicine, a Bachelor of Arts in Psychology, a Bachelor of Science in Social Services, a Bachelor of Arts in Sociology, a Master of Education Higher Education, a Master of Education Literacy, a Master of Education School Administration, a Master of Science in Health & Physical Education: Athletic Administration Specialization, a Master of Science in Health & Physical Education, a Master of Science in Information Technology and Administrative Management, and a Master of Education in Special Education. Students who have completed at least 40 college-level credits with a 2.5 GPA at least will be eligible to transfer to Central Washington University. Financial aid is available to students who qualify. Gonzaga University offers nine graduate degrees entirely online: an M.A. in Communication & Leadership Studies, an M.A. in Organizational Leadership, a Doctor of Nursing Practice - Post-Master's Pathway, a Doctor of Nursing Practice - Post-Baccalaureate Pathway, a Master of Science in Nursing, an R.N. to M.S.N., an M.A. in Sport & Athletic Administration, an M.A. in Theology & Leadership, and an M.E. in Transmission and Distribution Engineering. Online students have the option of taking courses in 16-week sessions beginning in January and August, 12-week sessions beginning in May, and 8-week sessions beginning in January, March, May, August, and October. Online students have access to student resources like the Foley Library, IT Help Desk, and the Career Center. Online courses are similar to on-campus courses in terms of content and difficulty level. There are several different forms of financial aid that online students can apply for such as grants, loans, and scholarships. Students say the top reason they attend City University of Seattle is the flexible, convenient classes, and the university's online degree programs are designed to provide flexibility with an asynchronous format. Students also value the experienced instructors, and City U was in the top 30 Best Online Bachelor's programs on the 2015 rankings compiled by U.S. News and World Report. At the bachelor's levels, online programs are available in more than a dozen disciplines, from cyber security to health care administration. At the graduate level, City offers the only PMI-accredited master's program in project management in the Northwest that students can earn in a fully online format. Shoreline Community College has more than 25 degrees and certificates online. Programs offered over the internet mirror the most popular pathways for Shoreline students, who primarily want to transfer to a four-year school or to get technical and job training. For students seeking to transfer, Shoreline has an Associate in Arts with eight majors online, plus a transfer business degree. These are all direct transfer programs that allow students to transfer with junior status. Professional and technical programs range from short-term (fewer than 20 credits) certificates to full associate degrees in fields such as business technology and supply chain management. Shoreline uses the Quality Matters review process to assure the quality of online class content. The University of Washington Seattle offers a number of online and hybrid degrees and certificate programs through its School of Professional & Continuing Education. There are two online bachelor's degrees offered - a Bachelor of Arts in Early Childhood & Family Studies and a Bachelor of Arts in Integrated Social Sciences. Both are degree completion programs. There are 17 online master's programs offered and 13 of these degrees can be pursued entirely online. The rest are hybrid programs that require occasional on-campus meetings in addition to online classes. The university has 65 certificate programs, 55 of which can be earned completely online. Canvas is the learning management system used by the university to facilitate online instruction and communication. Seattle College's four campuses offer a range of online courses through the joint Seattle eLearning collaboration. With more than 200 courses from the north campus offered online, students can earn an Associate in Arts degree through online classes. The Associate of Arts program is a Direct Transfer Agreement degree, and most colleges in the state will accept all 90 credits when students transfer from Seattle College. North Seattle College is one of the leading community colleges in preparing students to transfer to the University of Washington. North Seattle also has a few bachelor's programs and one, the Bachelor of Applied Science in International Business, has an online option. Western Washington University offers two degree-completion programs online. The programs are primarily designed for students in underserved areas of the state, such as the Kitsap and Olympic peninsulas. The degrees offered through the distance learning program are the Bachelor of Arts in Human Services and the Bachelor of Arts in Multidisciplinary Studies. The programs are open to Washington State residents who have already completed an associate degree or equivalent coursework, as these programs only deliver upper-division coursework. Applicants to the human services program should have a GPA of 2.75 or higher. Coursework for the human services degree is presented in six consecutive quarters spanning the fall, winter and spring quarters each year. Students in this program must complete three internships at field sites where they will be directly supervised. The multidisciplinary program allows students to customize a plan of study in the liberal arts that meets their academic interests and skills. Students can start this program in any quarter. Students can also earn a certificate in teaching English to speakers of other languages (TESOL) through 100 percent online coursework. On the lookout for an online degree from the Evergreen State? It can be tough to know where to start. You have to familiarize yourself with all the state’s degree and course offerings and then hope they’re affordable and reputable. So we’ve done the legwork for you! We’ve boiled down the most essential information about online workforce training, specific schools’ financial aid packages, and accreditation. When you’re done, we’ve given links to websites for further reading. Washington doesn’t publish a comprehensive list of all the online programs available to its students. However, if you’re going to school to become qualified for a specific job, the state has an excellent resource for you to use in your search. It’s called Career Bridge, and it includes plenty of online programs. The site has a sortable list of all training programs that “meet minimum performance standards for employment, earnings and completion rates.” You can limit your search to online programs with the click of a button. If you’re unemployed, you may even be able to get free training through WorkSource, a state initiative to guide Washingtonians to in-demand jobs. One of the ways it does this is by running the Worker Retraining Program through community colleges. See if you qualify for free training at Start Next Quarter. Or find a WorkSource office and set up an appointment to discuss online training opportunities specifically. Through the Running Start program, high school upperclassmen have access to the entire catalog of all the state’s technical colleges and several of its four year universities. That includes online courses. Juniors and seniors can take up to 15 credits tuition-free, though they’ll have to pay fees for the college credits they seek. Low-income? You can seek a fee waiver. Learn more about this and other aspects of the program on its FAQ page. You can also earn dual credit for high school and college. (Think: Advanced Placement and International Baccalaureate exams.) Students enrolled in the state’s online public high school, Washington Virtual Academics (WAVA), can take AP courses free online, then see where those credits will transfer using WSAC’s credit search tool. Many online students are looking for a fast, flexible way to get a degree and advance their career. There’s no faster way than by accruing college credit for skills you already have. Every schools in the state uses some sort of prior learning assessment — be it through a standardized test (e.g., CLEP or DANTES), a portfolio or other means. In fact, the state legislature tasks the Washington Student Achievement Council (WSAC) with increasing the number of students who receive prior learning credits. Of course, you can also transfer in credits earned at other schools. The Direct Transfer Agreement (DTA) associate degree is the easiest way to convert community and technical college coursework to a baccalaureate program, and the Washington 45 succinctly lists associate-level courses that transfer. Washington participates in the Western Interstate Commission for Higher Education (WICHE), which allows students to pay reduced tuition to attend an out-of-state school. For undergrads, it’s capped at 150% of in-state tuition. For graduates, you’ll pay the same rate as residents. What’s that mean for online students? Not much for students going to colleges where residents and nonresidents enrolled in online programs pay the same rates. But not every school does it that way, and students taking a mixture of traditional and online courses will surely benefit from lower tuition. If you live in the West but outside of Washington and want to study in the virtual Northwest, WICHE is also the way to go, as seven WA public colleges and universities are members (though only five offer reduced tuition to nonresidents). Students increasingly view the terms “online” and “flexible” as synonymous. But how about affordable? The following colleges meet our tough criteria for affordability and quality. To compare these schools with other colleges in the state, visit College Scorecard. Central Washington University’s distance education section lays out your program options; it also has some useful information about obtaining an online degree. At CWU, nonresident undergrads pay 150% the rate of residents (graduate students pay 125%), but those enrolled in a full online program qualify for a waiver that brings the cost down to the resident rate unless they’re in a self-supporting program (i.e., a program that does not receive state funding, such as a continuing education certification). Visit the school’s financial aid department for more paths to paying for college. Looking for quality? Washington State University’s Global Campus baccalaureate, graduate engineering and MBA programs rank highly with U.S. News & World Report (i.e. Top 30 rankings). In the Global campus, nonresident undergrads pay about 15% more in tuition than Washington residents do, but still significantly less than nonresidents in traditional programs. Graduates in the Global Campus pay the same tuition, regardless of residency. Plus, noncredit professional development courses through the Digital Academy are entirely free for students. Unlike many schools, WSU maintains a separate financial aid page for its online students. There, you’ll find two awards specifically for you: the ASWSU Global Scholarship and the ASWSU Global Internship Scholarship, both of which you can qualify for based on either academic merit or financial need. You don’t have to be enrolled at WWU to use WesternOnline. Whether you’re a lifelong learner dabbling in a new subject or a working professional trying to accumulate credits toward a WWU degree, you can sign up. (WWU students are, of course, also welcome.) You’ll have two choices, which you can mix: term-based courses that require an internet connection and self-paced courses in which you study independently. The latter are significantly cheaper. Since all of WWU’s individual course offerings are self-supporting — meaning the state does not fund them like other public school offerings — WWU students should talk with a financial aid representative about the effect of online classes on their funds. WWU also has a few online degrees that are state-supported, including the flexible Bachelor’s in Multidisciplinary Studies. Some Washington colleges choose national accreditation instead of going with NWCCU. However, many regionally accredited schools do not accept credits from nationally accredited ones. Other colleges choose specialty accreditation, particularly religious institutions. To check whether a college has government-recognized accreditation, visit the Council for Higher Education (CHEA) search tool. If a college isn’t accredited by an agency recognized by CHEA, you can’t get federal financial aid to attend, but you can still go there. The Washington Student Achievement Council (WSAC) keeps a list of schools exempt from WSAC oversight, including online outfits such as Worship Arts Conservatory and Woolston-Steen Theological Seminary that choose to forego accreditation. Keep in mind, however, that just because a school doesn’t have to seek accreditation doesn’t mean it shouldn’t. Below are colleges that have to clean up their operations or potentially switch accreditors. In many cases, the infractions are minor and technical, but in others they’re serious enough to threaten the school’s existence. ACICS accredits the Fife, Pasco and Vancouver campuses of this for-profit college, as well as the online arm run through the Vancouver campus. ACICS is a national accreditor whose status the U.S. Department of Education (ED) moved to revoked in 2016 (though ACICS launched a last-ditch appeal in October 2016). While ACICS appeals, Charter and all other colleges under its purview remain fully accredited. However, these schools are likely looking to jump aboard a different accrediting agency. In July 2016 NWCCU gave Clover Park Technical College a warning for failing to release audited financial statements on time and requested the college do so within three months. This is a fairly minor violation that Clover Park should be able to rectify. Everest College is a for-profit college with campuses across the country as well as an online branch. Two of its Washington schools — Tacoma and Everett — are accredited by ACICS, which is fighting an uphill battle against the ED to keep its status as a recognized accreditor. In the meantime, ACICS is still conducting campus visits. In fact, it issued a show-cause (as in “give us a reason not to pull your accreditation”) to the Everett campus in August 2016 because the financial records at its sister school in Tampa, Florida, “do not evidence financial stability.” In other words, it’s losing money and may have to shut down. To solve the problem of both being on show-cause and being aboard a sinking accreditor, Everest’s Washington state campuses are seeking accreditation with a different national accreditor, ACCSC, and leaving Tampa behind. Problem solved, right? Not exactly. Everest was owned by Corinthian Colleges in 2015 when those schools went defunct over multiple fraud allegations related to its graduation and job placement rates. Then, the Associated Press reported that its new owner, a debt collection agency, wasn’t much better. So, in May 2016 the ED placed a new independent monitor in charge of overseeing the colleges’ rehabilitation. In 2015 the Department of Education placed Faith Evangelical College and Seminary, also known as Faith International University, under something called “heightened cash monitoring 2” (HCM2) due to severe findings from a program review, which the ED says may include “failure to make refunds or return of Title IV funds.” Under HCM2, the Department does not trust the college to make financial aid payments to students, so instead of providing funds in advance, it reimburses the school afterward. This system puts a serious strain on a school’s finances and threatens their ability to function. The school remains accredited by Transnational Association of Christian Colleges and Schools (TRACS), which reaffirmed the school’s status in 2016. In 2016, NWCCU placed Grays Harbor College on probation for failing to undergo a proper external financial audit in time. The school has two years to clear up the issue, and has apparently already done so. It remains accredited throughout, and once the Commission is satisfied that it has undergone an audit, the probation will be lifted. Pinchot University has two problems: The first is that it’s accredited by ACICS. And while it might be looking to switch accreditors like other ACICS schools, that order is made taller by problem #2. The ED placed it on heightened cash monitoring 1 in March 2015 due to concerns about its financial responsibility; it still was on the list as of September 2016, so the government plays a direct role in overseeing federal financial aid funds earmarked for students. In 2016, NWCCU placed Tacoma Community College on probation for the same issue as Grays Harbor College: It didn’t receive audited financial statements in time. Like Grays Harbor, the school has two years to come into compliance but likely only needs one. It remains accredited while on probation. Northwest Commission on Colleges and Universities (NWCCU): The NWCCU is the regional accrediting body for degree-granting colleges and universities in Washington. Washington Student Achievement Council (WSAC): Though not exclusively for online learners, WSAC’s website is a helpful resource because it discusses the State Authorization Reciprocity Agreement in place for distance education, explains transfer policies between institutions and lists state-authorized schools. Washington Virtual Academies (WAVA): WAVA is a public school for K-12 students that is completely online and free to attend. Washington Career Bridge: Take a career quiz, get a personalized job guide outlining possible occupations, and discover the education programs in the state that can train you for these occupations. Washington State Board of Community and Technical Colleges (SBCTC): The SBCTC website doesn’t have an online degree search, but it does feature a degree program search that shows you which community colleges offer your program. From there, you can search the individual college’s website to see if the program is available online. Western Interstate Commission for Higher Education (WICHE): Similar to the SBCTC search, you can use WICHE’s Western Undergraduate Exchange or Western Regional Graduate Program search tools to find undergraduate programs in the Western U.S., then visit our other state pages to see if there’s an online degree or course directory for those schools.